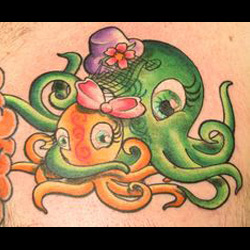 The octopus is an increasingly popular tattoo design, with both men and women embracing the animal as emblematic of personality, culture, and past experiences. As a creature of the deep, the octopus is often associated with mystery, the secrets of the ocean, and individual depth. The octopus also has a prominent place in several cultures, and has been a symbolic animal for hundreds of years. Many of the symbolic qualities associated with the octopus derive from its physical features and special abilities. For instance, when an octopus is trapped by a foe or predator, it can disengage one of its tentacles in order to escape. After a period of time, this tentacle will grow back, making the octopus a symbol of regeneration. In addition, this physical characteristic also represents the qualities of versatility and resourcefulness, which are both employed in the octopus's escape. Another unique physical attribute of the octopus is its ability to change colors according to its environment, a skill the octopus uses both to hide from predators and to hunt its prey. This ability to physically change colors can thus be used to signify the human characteristics of adaptability and ingenuity. As an ocean animal, the octopus can come to represent certain characteristics of water and the ocean as a whole. For instance, the octopus's natural habitat of the ocean floor means that it is truly a creature of the deep, and thus privy to the many secrets of the ocean and is aqueous psyche. Being so in touch with the underwater depths can translate into the human qualities of intuition, understanding, and quest for knowledge. Its home on the ocean floor also means the octopus is a grounded creature, and getting an octopus tattoo with other elements of its environment (such as the ocean floor or other ground-dwelling creatures and plants) incorporated into the design can really emphasize this quality. Within many cultures and societies, the octopus is present in underwater mythology. For instance, the ancient cultures of Greece, Egypt, India, and Babylon all have myths in which an octopus or octopus-like monster is depicted as a jealous creature attempting to prevent life on land; heroes must overcome these monsters, which was seen as the enemy of life on earth. Getting an octopus tattoo, then, can also be representative of these cultures if the specific artistic style of a culture is part of the design, and can also depict one's own commitment to life, or defiance of an enemy which tries to get in one's way. Many people assume that the octopus and squid are the same animal, but this is patently untrue. While there are certainly similarities between these two species, they are certainly not identical! There are several physical differences between the two animals: while both creatures have eight arms, squids also have two fins on their head and two tentacles. In addition, octopus have no solid bone or shell within their body, while squids have a 'pen', or stiff structure, that acts as a flexible backbone. In addition, octopi can only grow up to about 5 meters in length, while giant squids have been known to reach over 20 meters in length; that being said, octopi can be extremely heavy. 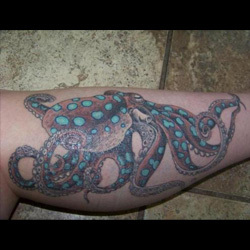 Thus, there are some major differences between the squid and octopus, so make sure you have a clear understanding of which animal you want to get tattooed on your body! These physical differences between the two animals will obviously translate into symbolic and cultural differences as well: this makes it extremely important to do your homework concerning the image and design, and that you also ensure that your tattoo artist is also clear on the design that you want. 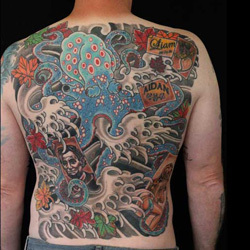 There is a wide scope for individualizing your octopus tattoo and making sure it's as unique as you are. Even some of the most popular designs are completely customizable and any good tattoo artist will be able to work extensively with you to ensure that the meanings and symbolism of your octopus tattoo is clear. Getting a cartoon-like octopus is popular for those who want to make a nod to pirate or high seas culture. Cartoonish does not necessarily mean silly or outlandish; rather, you can add human-like traits, such as an eyepatch, hook, or treasure chest, into your octopus design. Designing a more 'cartoonish' octopus can also allow you to play with the animal's facial features - does it have a fearsome expression as its attacking a ship full of pirates? Or is it an inquisitive creature which needs reading glasses for examining books? Mixing human and animal elements in your design is a great way to make your octopus tattoo truly unique. For conservationists, environmental rights activists, or simply those fascinated by Mother Nature and her mysterious creatures, getting a realistic octopus tattoo is a great option. The design should incorporate all the colors and details of the octopus, and may even include other sea creatures or elements of an underwater habitat. There are about 300 species of octopus, so you will have plenty of realistic options to choose from! Though small, the blue ringed octopus is one of the most deadly species of this underwater creature: these octopi contain deadly venom which is strong enough to kill humans. Therefore, getting this particular species tattooed on your body will let others know that, despite size or outward appearance, you are actually ready and willing to strike at any time. This particular species of octopus is easily identifiable by its yellow skin covered in blue and black rings - even though they only grow to be about 5-8inches, over 50 of these rings can be present on their bodies! While the octopus has been significant in many cultures for thousands of years, one of the most popular cultures to emulate in your design is Japanese. Within Japanese mythology, a giant octopus-like creature was known as Akkorokamui, and was very similar to the Kraken sea monster. Japanese octopus designs are known for their vibrant colors, and also for incorporating other elements of Japanese culture, such as lilies, and for being surrounded by colors such as blues and purples, almost as if an aura is present around the octopus. This style is also more realistic than cartoonish, so keep this in mind when discussing your design with your tattoo artist. Whether you want a full-back tattoo or a small design on your wrist or ankle, the octopus is a great choice for your next tattoo. 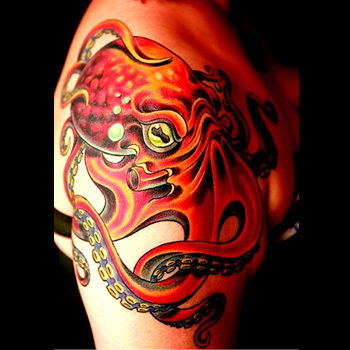 The myriad different qualities, traits, and cultures that the octopus embodies makes it an excellent tattoo for both men and women - so start working on your octopus tattoo design today! 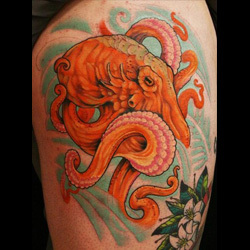 For custom design of a Octopus, you can check our Custom Tattoo Page.